Just what is Super Potato? Well, I want you to take a look at that photo for a few moments and try to absorb everything. 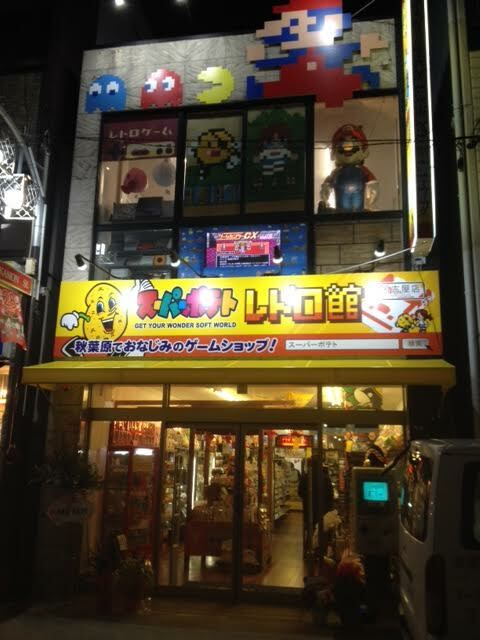 You’ll see Mario, Pac Man, and even a TV screen with the popular Video game show Game Center CX. 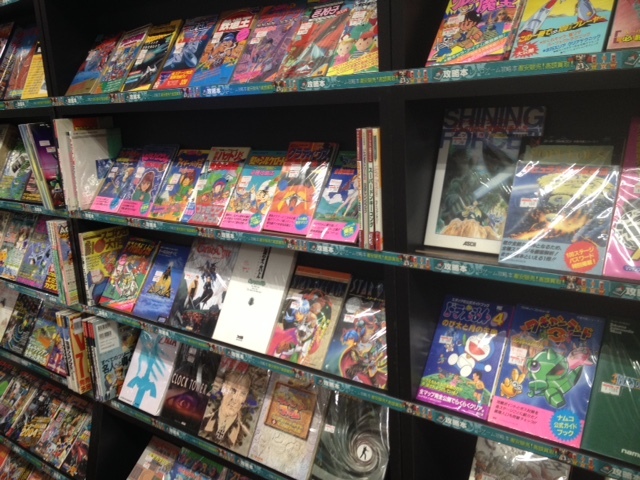 Super Potato is a popular retro gaming store that has roots back in Osaka and Tokyo. It is currently in the process of opening up more stores, and has recently opened one in Nagoya. After a few steps inside the store and it feels like you’ve stepped into a video game museum. 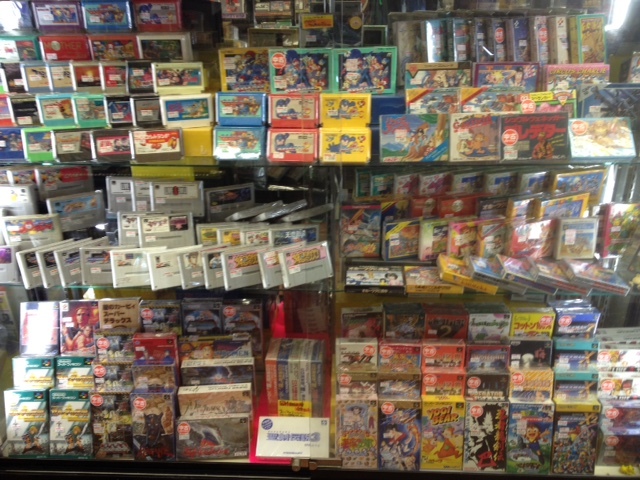 There are Nintendo, Super Nintendo, Game Boy, and Sega Genesis games brimming from shelves all around the first floor. Music, or perhaps I should call them “midi” songs play over the speaker as you shop around. It feels like you’ve turned on an old Nintendo for the first time in a long time and you are bombarded with nostalgia. Even if you weren’t born in the 1980’s or too young in the 1990’s, I think you can respect where many iconic game companies came from as well as their famous game series such as Enix’ Dragon Quest or Squaresoft’s Final Fantasy. To be able to physically touch an original Chrono Trigger box or see an un-opened, factory sealed Game Boy Advance Micro is an experience. Once you’ve gotten over the initial nostalgia factor of the game, it’s time to get down to business. This place isn’t really a museum. Everything in the store is for sale. The company prides itself on scouring both the internet and recycle shops around Japan to find the best and the rarest goods out there. Instead of downloading a game on your Wii virtual console or on the PSN nework, why not just spend a little extra and get the original hardware and the real game to play on it? Call me sentimental, but I like owning what I spend money on, and that means having the physical product instead of the digital copy. Retro gaming is still very much a big thing in the USA and overseas. Many of my friends back in the states still fire up their Nintendo 64 or Dreamcast from time to time, and I myself haven’t bothered to get rid of my Gamecube or PS2 yet. I don’t really see the reason to do so since most places only give you a few dollars for something you originally paid good money for. Super Potato allows you to pick up an original Famicom (or similar emulator), Sega Genesis, Nintendo 64, heck, they even have rare systems like the MSX2 (pictured above). It’s extremely easy to spend under $100 to get a system and a handful of games to play. But you’re probably wondering how this will work on our new LCD and Plasma TVs. Super Potato carries various accessories such as adapters, controllers, and cables needed to hook up your system to your TV. They are new, so you don’t have to worry about getting it home and having it break on you. 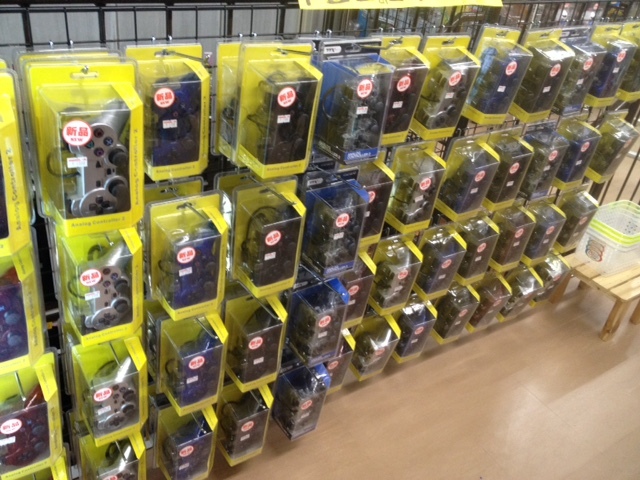 These kind of accessories aren’t carried in stores anymore, so if you already have the game system back home and need a replacement, you JUST might find what you’re looking for at Super Potato (online would work as well, but this gets rid of the hassle of mark ups and shipping). While the first floor is full of cartridges, hardware, and side-scrolling action, once you reach the 2nd floor you’ll suddenly be transported to a world of 3D. It’s here you’ll find Playstation One, PS2, and Game Cube Games, as well as some newer releases. These games are still in great supply around the country, but you never know what you’ll find. 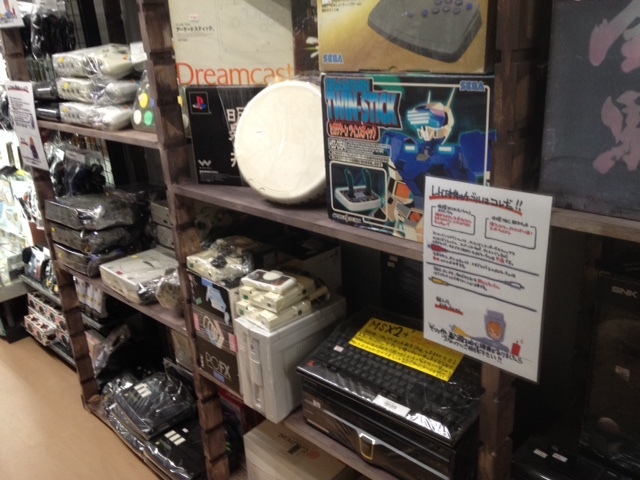 Super Potato tends to have a lot of the rarer games in stock, as well as accessories such as the Beatmania DJ tables. If you’re coming from a country where these sort of games were never released, there is a good chance you could take home some Taiko no Tatsujin drums (Taiko Drum Master) and other rare goods that could fetch quite a high value on eBay or other auction site. The second floor is also home to some old school strategy guides. The current generation is spoiled with their online Game FAQs. Back in the 80s and 90s, gamers had to either have their friends help them beat a game, or they had to purchase a strategy guide. Some of these guidebooks are pieces of art to look at, using hand drawn covers or intuitive design. Others are more of your mundane variety with just how to beat a game, but if you’re buying one now that’s not the point. You’re not really buying the book to know how to beat it, but rather to own a piece of that game’s history. It’s quite fun to look through. Before heading out, be sure to check out some of their T-shirts. 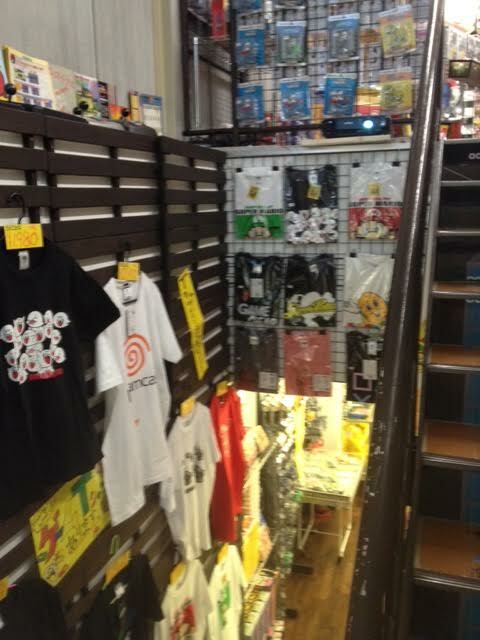 Prices tend to be in line with what most stores charge for similar goods (about 3000 yen), but you can find some T-shirt designs here that you won’t find anywhere else. If you can’t find what you’re looking for in the store, check out their website! Be warned, it’s all in Japanese though. If you’ve been to Nagoya before, it’s not that hard to get to. Super Potato is located on Akamondori Street in Osu Kannon, one of the major shopping areas of the city. If you’re coming from Nagoya station, the easiest way is to ride the yellow Higashiyama Line 2 stops to Sakae station. From there, transfer to the purple Meijo line going towards Kanayama station. Get off at Kamimaezu station 2 stops down, and head out of exit 9. Once you are on street level, walk straight down the street. You’ll pass a Starbucks on your left by the first shopping road, but keep going straight. Go past the parking garage and look for the 7/11 convenience store on your left side. Once you find it, turn left on that street (looking up from 7/11, you’ll see a large red arch with the words Akamondori in Japanese). Once on Akamon Dori, it’s only a 3 minute walk down the street. Walk past the shopping street on your left and look for Super Potato on the right side of the street, next to a couple of other electronic stores. If these directions are too difficult, check out their website and click on the link for directions to their Nagoya store (which should be their newest one near the top). If you have any other questions, please ask away. Otherwise, I hope you can enjoy the shop as much as I do and reminiscence about the early days of gaming! Thanks for reading. There are some figurine stores around town where you could probably find FF stuff. What exactly are you looking for? Mandarake is a good place to start and is literally 2 minutes from Super Potato, but there are tons of other shops that sell these types of goods all around Nagoya. You’re coming to Nagoya specifically? When? Oh okay! Yes! I’m arriving March 28th evening until March 30th noon then will take a shinkansen to Osaka 🙂 I plan on going around the Osu area the 29th (Sunday). I hope the shops are open then. If I’m not busy I can show you around! Really? You’d do that? 🙂 That will be great! Even if we just go around the Osu area 🙂 How can I contact you when the dates get closer? You can send me a direct message on Twitter when the dates get closer and we can arrange a time and place to meet up. If a console from super potato didn’t work when I got back to my hotel will they exchange it? If you have the receipt and explain that it didn’t work I think they should. I’ve never bought one from them though. I would think they’ve tested them, but you never know. 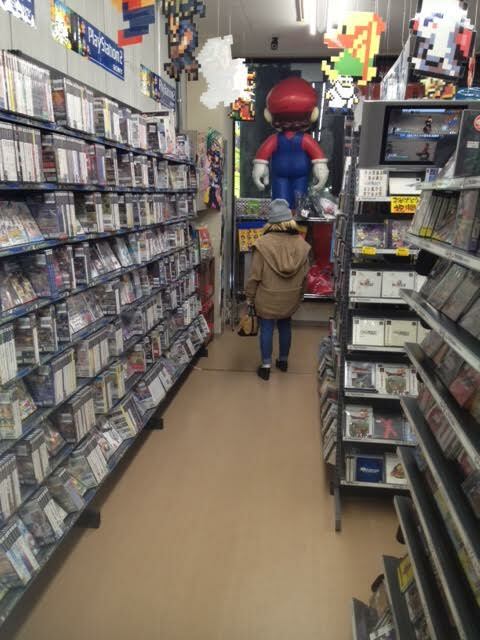 If you’re going to the Akiba location, it’s probably not worth going to the Nagoya location as Akiba has a larger selection of used games and used game stores in that area. Nagoya is nice if you’re already planning a trip in the area and want to kill some time.